UPSC NDA Previous Year Question Papers with Answers – National Defence Academy (NDA) and Naval Academy Examination (NA) exam is one of those prestigious exams that witness 4 to 6 lakh registrations each year. Out of those a mere 6000-7000 clear for the SSB interview rounds. The data here in front of you is the proof of the level of the examination and the strict selection criteria. Thus, now you know it is important to prepare well for UPSC NDA exam if you really want to join NDA or NA after 10+2. Therefore, here are UPSC NDA Previous Year Question Papers with Answers so that you know the level and type of questions asked in the exam. Latest: If you are looking for NDA Answer Key 2019 of UPSC NDA & NA I 21 April 2019 Exam, then please click here. Why is it important to have the previous years’ question papers and their answers with you? Well, it is clear the with the help of previous years question papers you can check the trends followed, how the difficulty level has changed over the years and what is weightage of different topics in the exam. We keep on adding the question paper for the current session here after the exam is held. Nothing rocket science here! Simply you need to put the resources provided above in good use for your preparations. Now the thing is how you put the resources in good use? 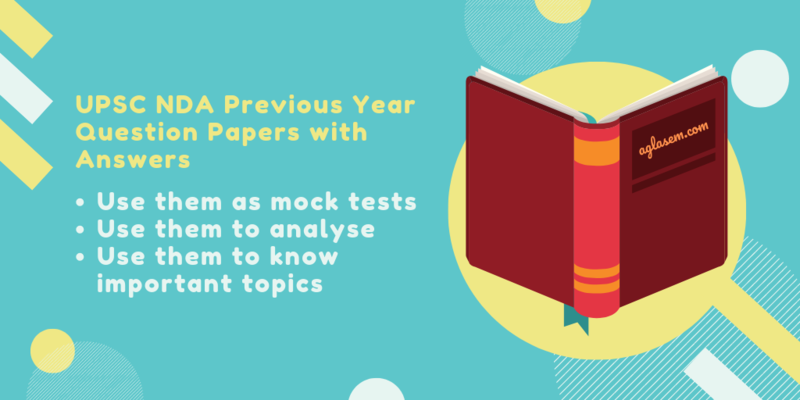 The previous years’ question papers are one of the most important preparation resources like from the syllabus for the exam. Therefore, here is how to use the UPSC NDA Previous Year Question Papers with Answers efficiently. Use them as mock tests: You can use the previous years’ paper as a mock test question papers and practice for the exam. Since the UPSC NDA Previous Year Question Papers the real exam papers it gives the feel of the real exam. This prepares you in the best possible way for the exam. 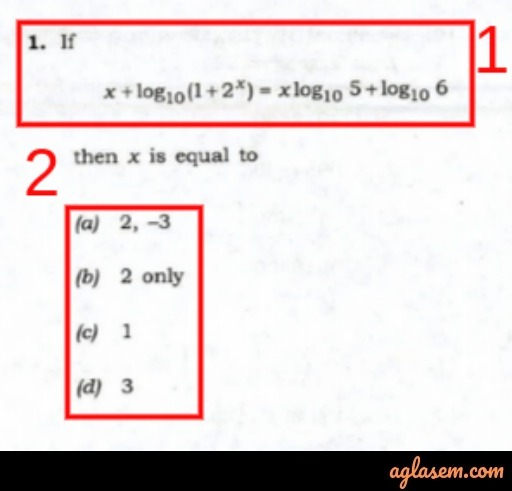 Analyze the Question Papers: Simple practicing the questions are not enough. Analyze the pattern and the changes in the level of the difficulty over the years. Take 2012 question paper, 2014, 2016 and 2018 and analyze how the papers have changed in 2 years gap. You can guess what might happen in the year in which you are appearing for the exam. You can be a bit more mentally prepared for the difficulty level. Check the weightage of topics: You can easily check that over the years from which topic most of the questions are asked. Are the weightage over the years same for the topics or they are uneven? This gives you an idea of the most important chapter to study for the exam. 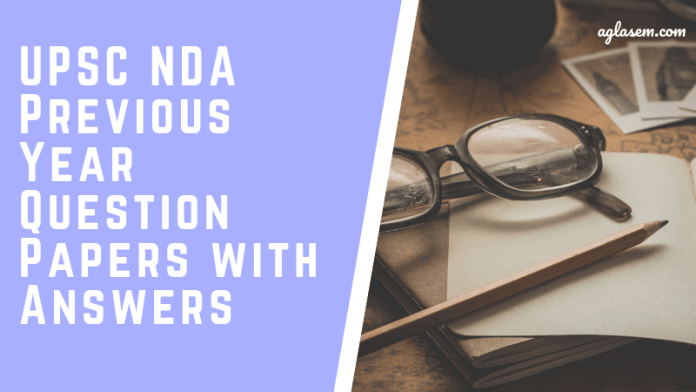 These are the 3 most efficient ways to Use The UPSC NDA Previous Year Question Papers with Answers. Click on the direct link made available in the table above. Check PDF file you need and open the same on a new window. The download option is then made available there. Download the question paper with answers and use it as mentioned in the section above. After the exam is over each year, the answer keys are made available on the same day as the exam. The candidates can check those answer keys right after the exam day to get an idea of their scores in the UPSC NDA and NA examination. These are the unofficial answer keys, however, they are a good source to know how many answers one has got right in the exam. The candidates can also check the official answer key for the exam the is uploaded by UPSC later on, usually with the result of the UPSC NDA and NA examination. Negative Marking: There is a negative marking for every incorrect answer. The above uses of the UPSC NDA Previous Year Question Papers with Answers make it clear why they are significant. Using the question papers and answers the candidates can give their preparation an edge and they can stay more prepared for the exam day. You can strategize how to go about attempting the questions on the exam day using the previous years’ question papers. You strategize which section to attempt first and which section to attempt later. Basically, you can check the blueprint of the question paper that will be made available to you on the exam day. Most importantly, you can read the instructions on the question papers before the exam day. This will help you stay more prepared for the exam day and be ready as per the instructions on the same. Hello sir.. Jo NDA ke through Sirf army ki preparations krna chahte h use bhi maths ka exam Dena hoga Kya?? Yes, The cut off is 25% in each subject means 75 marks in maths and 150 marks in GAT (general apttitude test) paper but to get qualified for SSB you have to score atleast 320. Cutoff is generally around 40% in each paper. Scoring 40% keeps you in a safe zone. Then in SSB you have to score around 390+ to get admission in NDA. Sir, I don’t have maths then i have to give maths exam in NDA. Hi Sir I am Abhishek Dwivedi without Math or Physics can I apply for NDA Exam form, Kindly suggest me thanking you. 10+2 Cadet Entry Scheme at Indian Naval Academy without maths and physics. Hi sir. My D.o.B is 27/06/2000 and i’m not yet 19 yrs old. Can i write NDA I 2019 ? The age limit is the first eligibility criteria that candidates match with their details. The date of birth range is 16 ½ to 19 ½ as mentioned above will be the age range for the candidates who can apply for the NDA . For math & GAT Which book I want to read . I just give my 12 class exam. As you have given the 12th exam you must have a good hold on Maths and Science, so to polish your skills, you can go through the books, Pathfinder and NCERT (11 & 12) for maths. For General Knowledge – PATHFINDER, and for science- Arihant Encyclopedia of General Science and NCERT (9–10).